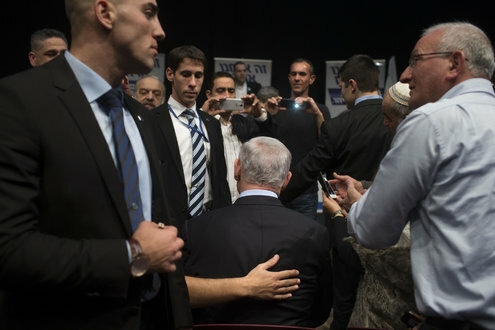 Prime Minister Benjamin Netanyahu of Israel spoke at a Jewish settlement the day before the Israeli election, warning that his opponents Tzipi Livni and Isaac Herzog would fail to protect residents. Video by Reuters on Publish Date March 16, 2015. Photo by Abir Sultan/European Pressphoto Agency. JERUSALEM — Prime Minister Benjamin Netanyahu of Israel said Monday that as long as he is the leader, a Palestinian state would not be established, reversing his support for a two-state solution to the Israeli-Palestinian conflict. The comments reversed a 2009 speech in which Mr. Netanyahu endorsed the concept of two states for two peoples between the Mediterranean Sea and the Jordan River. 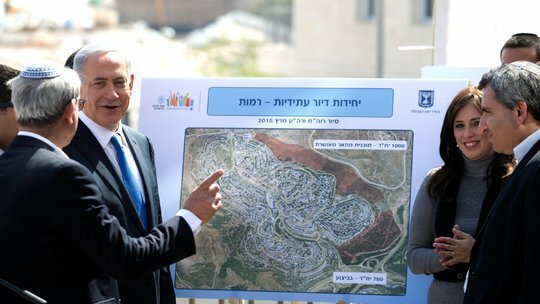 Mr. Netanyahu also visited Har Homa, a Jerusalem neighborhood where construction on land Israel captured in the 1967 war ignited international outrage. 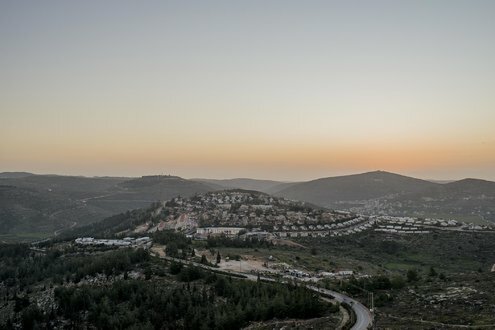 Mr. Netanyahu said he had authorized that construction during his first term to block Palestinians from expanding Bethlehem, and to prevent a “Hamastan” for militants from sprouting in the hills nearby. Mr. Netanyahu has long heralded Israel’s right to build anywhere in Jerusalem, but he generally says that his expansion of settlements — which most world leaders consider illegal — do not materially affect the map for a potential two-state solution to the conflict with the Palestinians. His acknowledgment that Har Homa was intended to disrupt Palestinian development between Bethlehem and Jerusalem — which the Palestinians see as their future capital — came as he sought to win back votes for his Likud Party and to take them from more conservative factions that oppose a Palestinian state. Palestinians and their international supporters staged huge protests against Har Homa in the 1990s, precisely because of its location at Jerusalem’s southern edge, arguing that preventing a connection between Bethlehem and the Arab neighborhoods of Jerusalem threatened the viability of a future Palestinian state. Har Homa, one of about a dozen Jewish areas on land that was occupied by Jordan before 1967 and annexed into Jerusalem by Israel after the war, is home to 25,000 people today. Most were drawn not by ideology but by the large apartments, parks and playgrounds, stunning views and lower prices than in the city center. Israelis return to the polls on Tuesday, only 26 months after their last national election, but the political dynamic has changed. The center-left Zionist Union alliance, Mr. Netanyahu’s main opponent, has emphasized pocketbook issues throughout the campaign. So have two centrist contenders, the Yesh Atid party of Yair Lapid, and Kulanu, headed by Moshe Kahlon, a former minister who quit Likud because of its failures on housing and other economic matters. With polls showing that Likud is trailing behind the Zionist Union, Mr. Netanyahu in recent days called on Mr. Kahlon’s supporters to “come home to the Likud,” and on Sunday, he promised to make the Kulanu leader finance minister. “Kahlon and I will know how to solve the housing problems together,” the Israeli leader said. Mr. Kahlon rebuffed the offer. He has not said whether he would recommend Mr. Netanyahu or Isaac Herzog of the Zionist Union to be prime minister, and analysts see him as a crucial power broker in the formation of any coalition government. Mr. Netanyahu has focused more on his right flank, appearing at a rally Sunday evening in Rabin Square in Tel Aviv that was organized by settlers. Many in the crowd, estimated at 25,000 people, had been bused in from the occupied West Bank, according to local news reports. At the rally, Mr. Netanyahu vowed that there would be “no withdrawals” from the West Bank and “no concessions” to the Palestinians. In the interview with NRG, a website tied to the newspaper Makor Rishon, which largely serves settlers, Mr. Netanyahu said he also said he would continue construction of settlements in the occupied West Bank. Mr. Netanyahu said that Mr. Herzog would give East Jerusalem as a capital for the Palestinians. “Me and my friends in Likud, we won’t let that happen,” he added. Also on Monday, the Zionist Union announced that it had dropped a plan to rotate the premiership between Mr. Herzog of the Labor Party and Tzipi Livni of the smaller Hatnua faction, making clear that Mr. Herzog was the sole leader. The rotation agreement had been seen by some voters as a sign of weakness and Mr. Netanyahu had focused much of his attack on the less popular Ms. Livni.